Galco Dublin has unveiled a major upgrade to its facilities that will help to deliver continued high-quality service to customers across the construction, agricultural and engineering sectors. This new galvanizing bath will make a big difference to the volume of work we can carry out in the future. The new tank, which measures 4 m by 1.8 m by 2.65 m will be an addition of 40% capacity and will sit alongside Galco`s existing 10 m x 1.8 m x 3.25 m bath. It will play an integral part in the company’s ongoing galvanizing work, where steel is dipped into molten zinc at temperatures of up to 450°C to provide a long-lasting protective coating against corrosion and rust. The opening of this new galvanizing plant and the synergy it will provide to other business units will enable us to ensure our customer base that we will be proactive in meeting their future requirements. As an organization, we are always looking to identify new processes and systems to enhance our products and service, and due to the specific technological components of this upgrade, Galco Dublin will benefit from better gas consumption and improved electrical consumption, as well as the higher production rates. 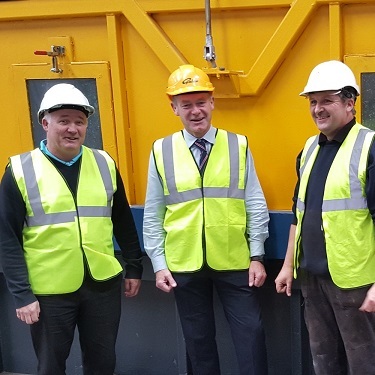 Ongoing investment across our 5 Irish plants is a key priority in Galco’s overall growth strategy, and this new plant will enable the team at Galco Dublin to deliver a high-quality service to their customers throughout the region for years to come. We are wholly committed to ensuring our processes are as sustainable as possible, and we are delighted that our new galvanizing bath includes many features which will help us to be ‘greener.’ We are already delighted with the new system and are very much looking forward to passing the benefits onto our own customers.